Above, we have what The On-Line Museum and Encyclopedia of Vision Aids believes is the world’s oldest surviving pair of glasses. Dating back to the 15th century, the glasses belonged to the Eighth Shogun, Yoshimasa Ashikaga, who reigned from 1449 to 1473, during the Muromachi period of Japanese history. 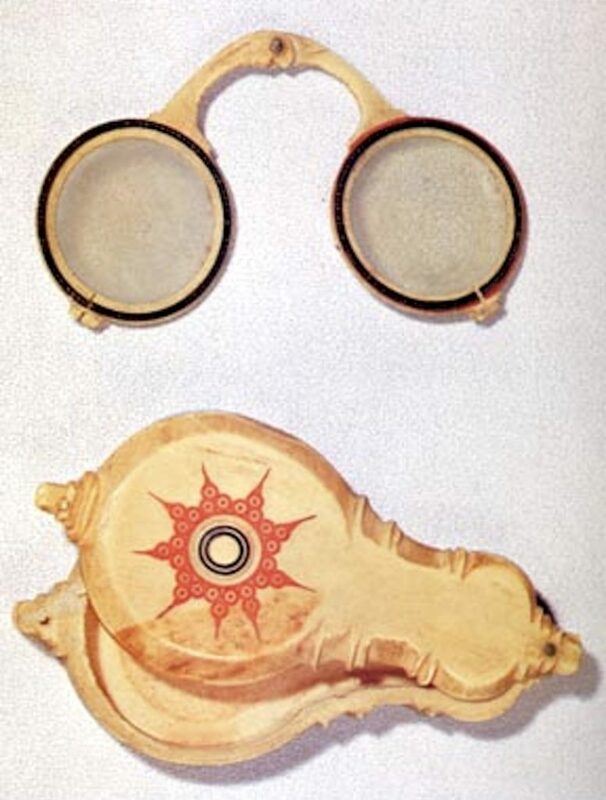 Both the glasses and their accompanying case were made of hand-carved white ivory. Glasses were actually first invented, however, in Italy (some say Florence, to be precise) in 1286 or thereabouts. In a sermon from 1306, a Dominican friar wrote: "It is not yet twenty years since there was found the art of making eyeglasses, which make for good vision... And it is so short a time that this new art, never before extant, was discovered." In the mid 14th century, paintings started to appear with people wearing eyeglasses. (Take for example Tommaso da Modena's 1352 portrait showing the cardinal Hugh de Provence reading.) A gallery of other historic eyewear can be viewed here. In the museum The Markiezenhof we have a 14th century pair of glasses.